I’ve been using e-cigs for over 5 years & thought I’d share my experiences, along with what I’ve found to be the most affordable advanced personal vaporizer & accessories that I’ve been using for nearly 2 years. But before starting, if you’re an e-cig newbie (or even an experienced e-cig user), I strongly recommend you read The Complete Guide to E-Cig Safety. It has a wealth of useful info that’s applicable to ALL e-cig users. When I first started there wasn’t nearly as much info available on the web yet. Before trying my first e-cig in Feb 2009, I had been smoking for 41 years & was a solid 2+ pack/day cigarette (analog) smoker. My reasons for switching to e-cigs is documented in a previous blog post. I was fortunate when I first tried e-cigs, as the tobacco companies were not yet involved. There were very few, if any, disposable e-cig devices available. I started out with what they called “pen style” electronic cigarettes. They consisted of a battery & an atomizer/cartomizer with e-liquid that was easily refillable. My first purchases were from epuffer.com (Elite Classic pen style), but I soon migrated to minicigarette.com and then settled on Vapor4Life products a year after my first e-cig purchase. The problem with the numerous beginner e-cigs styles available is that each brand usually locks you into a particular thread type and expensive batteries ($15-25) that aren’t readily interchangeable with other e-cig brands. That means you often cannot share batteries or atomizers/cartomizers with other brands of e-cigs, which is one reason why I stayed with Vapor4Life. An e-cig compatibility guide can be found here. Most e-cig guides & forums recommend that beginners start out with “mini” (AKA “cig-a-like”) style, but I’d caution you to stay away from most all devices being offered by the tobacco companies. 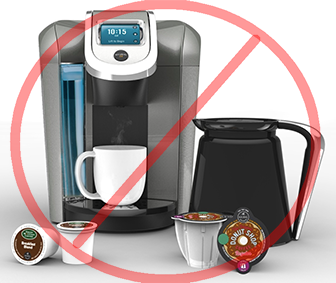 They are producing products that are in THEIR best interest (disposable; non-refillable; & expensive). There’s a ton of information about e-cigs on the web — look for it! In addition, I strongly recommend new e-cig users visit the “e-cigarette forum (ECF)” website. They have numerous forums that cover just about everything you’d ever want to know about electronic cigarettes. My “e-cig upgrade path” went from a year with pen style w/refillable cartridges; a year of tanks attached to the same pen style battery; and to my first mod in 2012, the variable voltage “Handle” (Vapor4Life). It is powered by a Li-ion 18650 flat-top battery & had the same KR808D thread as all my other Vapor4Life cartridges, cartomizers & tanks. It’s variable voltage was adjustable from 3.0 to 6.0 volts and allowed me to select the perfect vapor strength. Although I’m still using the Handle’s that I purchased 2 years ago, I wouldn’t recommend them due to their fragility & cost. They are always one drop away from breaking apart. The battery door on both of my VV Handle’s are held together with rubber bands. After my variable voltage mod (VV Handle) with it’s selectable vapor strength & my first unprotected Li-ion 18650 battery, I was hooked. Li-ion batteries of sufficient capacity (>=2000 mAh) last for nearly a day before needing a recharge and are available for as little as $5 each. With pen style batteries, with capacities between 150 – 420mAh, you need several for a day of vaping. By this time I had lots of V4L tanks with cartomizers of different resistance (1.5, 2.0 & 2.5 ohm), so I decided to pursue “variable wattage” (VW) APVs. With variable voltage (VV) APVs I needed to change the voltage every time I changed to a cartomizer/atomizer with a different resistance in order to get the proper vaping strength. With a variable wattage APV, I can use the same wattage setting on all cartomizers/atomizers, because it will measure their resistance & assign the proper voltage for any particular wattage selection I’ve made. VAMO V5 VV/VW APV. Available from many websites, my latest purchases were from Varitube for $39.95. 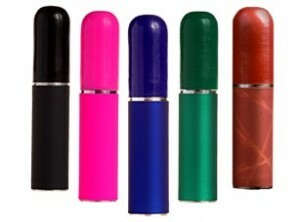 There are many similar tube style APVs like this available, and many exceed $100 in price. The VAMO has a 3-button configuration, which I greatly prefer over the 1-button config that is much more common. 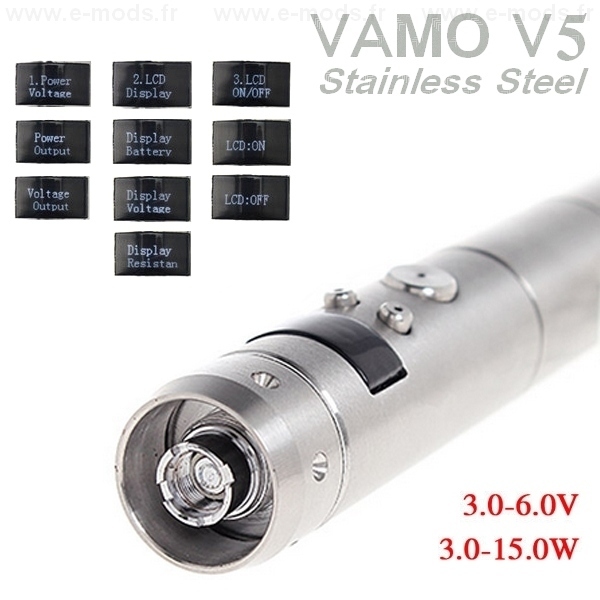 The VAMO V5 has a 510 & EGO type thread. Vapor4Life’s Smileomizer. I switched from tanks to the Smileomizer over 16 months ago and seldom use anything else. They come in two sizes, a 3.5ml small and a 6ml large. I prefer the small 3.5ml size and it can be refilled over a dozen times. I usually get a solid 2 months use for each one as long as I don’t run it dry. I’d recommend signing up for the V4L newsletter, as t hey have at least one or more sales a week & you can get as much as 40% off the current price of the Smileomizer, which right now is $59.99 for a 10-pack of the small size. At 40% off that comes to about $3.60 per Smileomizer. Right now the Smileomizer only supports the KR808D type thread, so’ll you need to purchase a “510 to 808D” adapter in order to use the Smileomizer with the VAMO V5 (and most all other APVs, as nearly all have the 510 thread type). V4L has stated that they plan to market 510 type thread Smileomizers in the future. 510 to 808D Adapter. 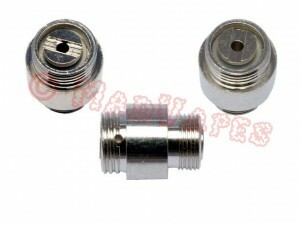 You’ll need this to connect your Smileomizer to the VAMO V5 or other APVs. They’re available from many websites, including V4L, but Madvapes has one of the cheapest prices @ $2.49. I’ve been using these adapters on several tube & box style 510 APVs for nearly 2 years and haven’t had any problems. E-Juice. Up until a year ago I purchased all my e-juice from Vapor4Life. When I purchased my first VAMO V2 from Madvapes, I tried their “Top Vapor” e-liquid and really liked it — plus, it’s about 40% cheaper at $8.29 per 30ml bottle. Li-ion Batteries. There are many, many different types and brands of Li-ion batteries — Li-Mn (IMR); protected vs. unprotected; flat-top vs. button-top, , etc.). You need to do your research, as there are apparently many counterfeits out there, even on mainstream sites like Amazon. Many sites, including e-cigarette forum, recommend that you only use protected or safer chemistry batteries (Li-Mn, or IMR). I’ve used over half a dozen APVs, and each one had built-in battery protection. I strongly recommend this feature on any APV you purchase. For APVs with built-in protection, I’ve found that unprotected, flat-top Li-ion or IMR batteries work best. In fact, I’ve had very poor luck with any protected Li-ion battery in APVs with built-in battery protection. The battery I’ve been purchasing for nearly two years is the Panasonic NCR18650B 3400 mAh. I’ve purchased nearly a dozen, all from Amazon, and have had excellent performance. I’ve paid as low as $8.50 per battery to as high as $9.75. Here are test results from BudgetLightForum.com and battery specs from Panasonic. So… are Li-ion batteries dangerous? They can be… but not if you follow common sense & heed all the warnings. One of the most important warnings is to NEVER allow your batteries to short circuit. Always store them in a plastic or non-conductive case that prevents them coming in contact with other cells or anything conductive. And yeah… that means you DO NOT carry bare Li-ion batteries in your pocket with change, keys, etc. Another important warning is DO NOT overcharge your Li-ion cells, which is why your want a high quality Li-ion battery charger that ensures this will never happen. 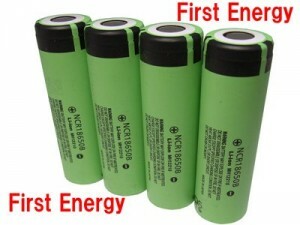 And lastly, DO NOT leave your batteries or e-cig unattended when charging and DO NOT charge your batteries overnight. The Complete Guide to E-Cig Safety mentioned above has a dedicated section titled A Guide to Safe E-Cig Charging & I suggest that you read it. Many e-cig websites have FAQs and/or tips on Li-ion battery use, care & warnings. Seek them out… they’re easy to find. Li-ion Charger. I’ve come to believe that the Li-ion battery charger is one of the most important devices in your e-cig kit, especially when dealing with Li-ion batteries. I’d venture that most all the chargers that are provided with APV kits are basically crap (not necessarily dangerous… just crap). I unfortunately wasted money on two other relatively cheap chargers before stumbling upon the Efest LUC V4 charger at WhimWhamVapes.com. It is by far the best Li-ion charger that I’ve ever used, and also comes in a 2-cell version (I have both). These chargers have way too many features to list (including LCD readouts of each battery’s voltage), so visit the WhimWhamVapes or Varitube web sites to read about them. BTW, you may find these chargers elsewhere (i.e., Amazon) for a cheaper price, but they usually don’t include the car charger adapter cord & other cables. The models sold at WhimWhamVapes & Varitube both include all accessories. That’s my current e-cig eqmt, and since switching to VV/VW APVs I haven’t once had the urge to smoke an analog cigarette. I can’t say the same thing about pen style or “mini” e-cigs. Apparently tanks are a hot item these days, along with rebuildable atomizers. I still use tanks occasionally, but I’ve had too many flooded or leaking tanks over the past 3 yrs. There’s nothing like a leaking or flooded tank to completely ruin your e-cig experience! I’ve never had any problem with Smileomizers and they provide every bit of the vaping experience that I previously had with tanks.